A sensitive, rapid, and simple fluorimetric procedure for the determination of artemisinin in a concentration range of 0.1–7 μM was developed with the use of microperoxidase-11 as a peroxidase biomimetic (RSD = 0.8% at LOQ, n = 5; LOD = 7.1 nM (3s0)). The determination is based on the fluorescence quenching of the cationic xanthene dye pyronin B (Stern–Volmer quenching constant, 0.101 μM–1) in the presence of microperoxidase-11. The procedure was tested in the analysis of a biologically active additive based on an Artemisia annua wormwood extract. 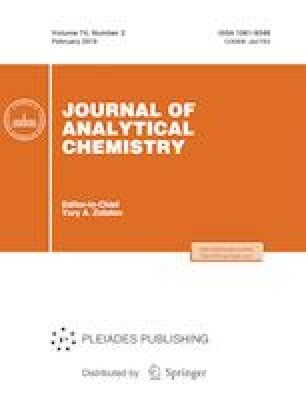 The correctness of the results of the fluorimetric determination of artemisinin in a biologically active dietary supplement was confirmed by HPLC–mass spectrometry. The use of oligopeptide microperoxidase-11 instead of heme-containing proteins (hemoglobin, cytochrome c, and horseradish peroxidase) made it possible to shorten the duration of artemisinin determination by a factor of 2 with the retention of sensitivity and selectivity. We are grateful to Cand. Sci. (Chem.) A.N. Stavrianidi (Moscow State University) for his assistance in the HPLC–MS analysis of BADS. This work was supported by the Russian Foundation for Basic Research (project no. 15-03-05-064a).